We have two favorite Chinese foods around our house: Cantonese dim sum, with its infinite variety of dumplings and small bites, and Szechuan style, with its mouth-numbing peppercorns and chilies. As our food appreciation classes landed in China this week, I chose a simple but delicious dish from the latter category: mapo tofu, slithery bites of silky tofu bathed in a potentially fiery but immensely pleasurable sauce of chilies, garlic, Szechuan peppercorns and fermented black beans. As you may have gathered already, these are not ingredients you see every day at your local supermarket. Indeed, you will want to locate your nearest Chinese grocery for this, or check the internet for mail-order sources. And cooking in an authentic Chinese wok is preferred, although you might get away with using a deep, heavy skillet. But mapo tofu is worth every bit of effort you put into it. The kids in our classes declared this to be one of the best dishes we’ve ever made. And you will be so proud of yourself when you discover that making it is not so terribly hard, and that you can do it at home. This is one of those dishes that calls for having all of your components prepped and close at hand so that they can be thrown together in the wok in rapid succession shortly before serving. Start by soaking a small fistful of fermented black beans overnight in a small bowl of warm water. This re-hydrates the beans and removes the salt. The following day, make a sauce by whisking together in a measuring cup 1/2 cup chicken broth, 2 teaspoons corn starch, 2 teaspoons soy sauce and 1 teaspoon sugar. Set aside. Finely chop 3 cloves garlic and 1 small knob peeled ginger. 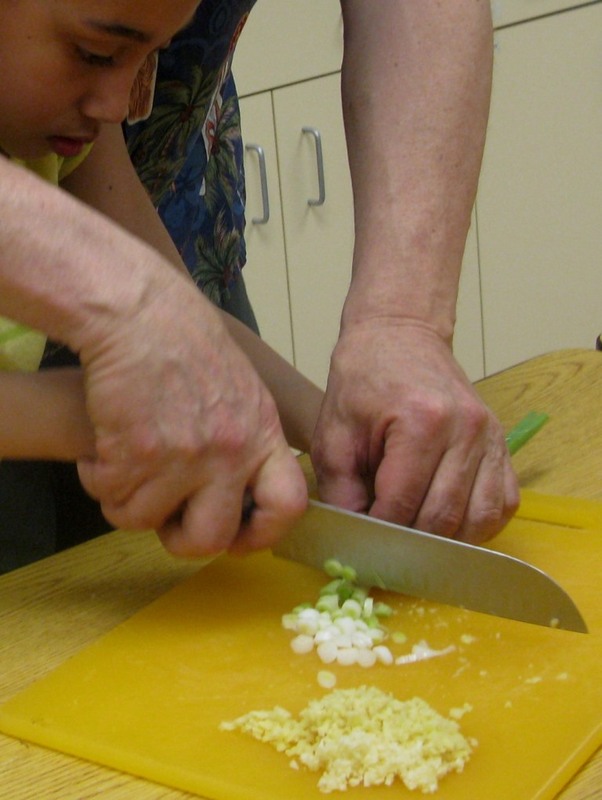 Chop 4 scallions, keeping the white and green parts separate. Grind 1/2 teaspoon Szechuan peppercorns (either in a spice mill or with mortar and pestle). Szechuan peppercorns are no ordinary spice: they are much lighter than standard black peppercorns and have a mouth-numbing effect. Set aside 8 ounces ground pork and a jar of spicy garlic sauce (aka chili garlic sauce). While you are getting your ingredients ready, heat your wok over moderately high heat. You want your cooking oil to smoke a little when you add it to the wok, but you don’t want it so hot that it burns the vegetables. When the wok is sufficiently hot, add 2 tablespoons sesame oil. (We used toasted sesame oil for the added flavor). Immediately add the chopped garlic, ginger and white parts of the scallion. Stir vigorously. When the onion begins to wilt, push the aromatics up the sides of the wok so they don’t burn. We have a metal Chinese tool for this that looks like a small shovel with a long handle. But you could use spring-loaded tongs, a long-handled metal spoon or something similar. Next add the ground pork. Poke the meat, turn it, chop it with your cooking utensil so that it browns as bite-size pieces. Stir in the black beans (drained) and season with the ground Szechuan peppercorns. Add 2 teaspoons of the spicy garlic sauce (or more if you like things hot), then pour in the chicken broth mix. You will first want to give it a stir to re-incorporate any corn starch that has settled on the bottom of the measuring cup. Stir all of the ingredients together and add 1 pound silken tofu cut into bite-size cubes. Allow the dish to cook, stirring occasionally, until the sauce has thickened. This should take hardly any time at all. Remove from heat. 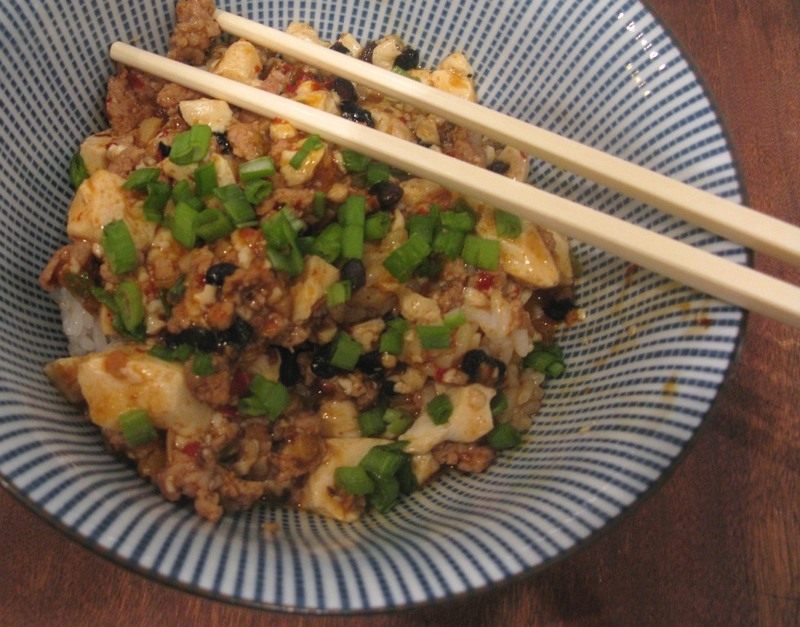 Serve the mapo tofu immediately over brown rice in warm bowls. Garnish with the chopped green parts of the scallion. As I said, our kids thought this was the best thing we’ve ever made. Who knew?